Building Brains and Brawn - College Hockey, Inc. Schedule, coaching and facilities allow NCAA prospects to develop physically while in school. 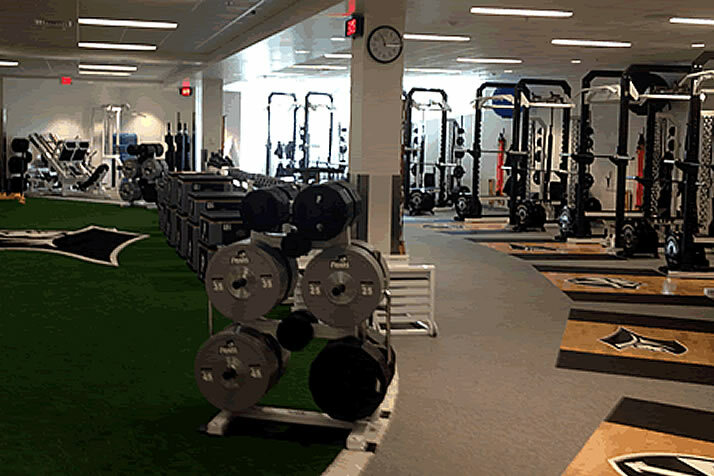 Facilities like Providence's new weight room give NCAA players access to state-of-the-art strength training equipment. This story originally appeared as part of a four-page special college hockey section in the Nov. 4, 2013, edition of The Hockey News. When you’re a 16-year-old elite prospect like Boston College defenseman Mike Matheson was, it’s hard to wrap your head around the enormity of the decision you’re about to make. Most kids at that age are begging their parents for a driver’s permit; Matheson and many other hockey players are deciding whether to go to college or play major junior and nullify your NCAA eligibility. For Matheson, a 2012 first-round draft choice of the Florida Panthers, the choice wasn’t simply about what was going to happen on the ice. He was just as concerned with what he would be doing in his time off the ice, specifically strength and conditioning training, which played a huge role in his decision to play college hockey and attend BC. That strength and conditioning base is vital to success at the next level, especially for players like Matheson, who have top-flight NHL potential. Paul Goodman is in his sixth season as strength and conditioning coach for the defending Stanley Cup champion Chicago Blackhawks. Prior to that, he spent six seasons as the strength and conditioning coach at the University of Vermont and earned his masters degree at the University of Wisconsin while also working with the Badgers’ hockey program. Goodman not only works with current Blackhawks, but every summer he works with the team’s prospects during its annual development camp. College athletes not only benefit from the time allowed by the schedule, but also the expertise of full-time strength and conditioning coaches like Goodman, and state-of-the-art facilities designed to promote player development. The college hockey season is unique in that it’s the highest level of the sport you can play while also allowing your body to make gains in the weight room during the season. Those gains aren’t just for strength, but also injury prevention and can help keep a player’s body on the ice and in the game. “In the NHL, all we can really do during the season is maintain and try to prevent injuries,” Goodman said. “You’re playing so often that it’s hard to make gains during the year, and I think the schedule in juniors is very similar, so with our guys in the NHL, we need to see those gains made over the summer in the offseason and it’s the same in the junior ranks. On the ice, Matheson also prescribes to the theory that practice makes perfect. Ask a few current NHLers and you can’t argue with results. Horcoff played 49 games in the NHL his first professional season. San Jose Sharks center Adam Burish shares a similar success story. After four years at Wisconsin, he jumped right into the NHL his first pro season. That preparedness is often the slight edge that helps a player earn that final roster spot. Mike McMahon is a senior writer for College Hockey News.